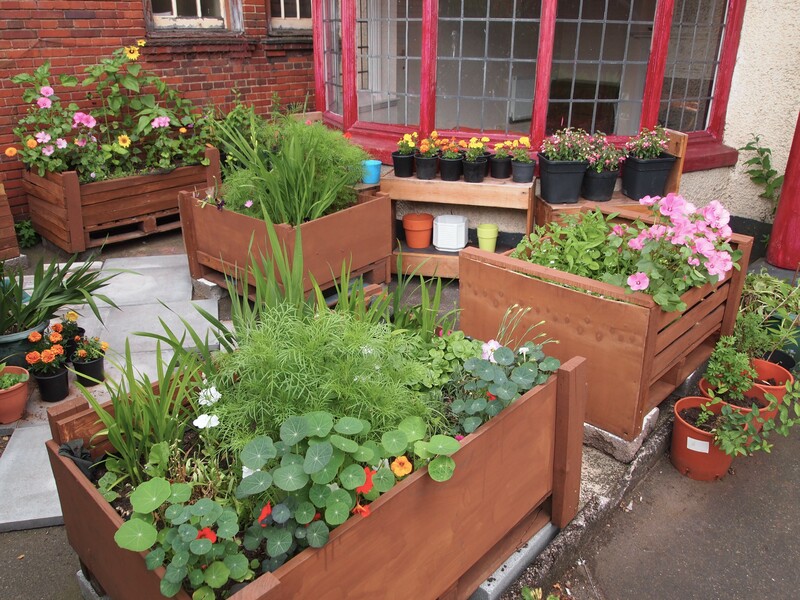 A wonderful pop up garden has appeared in front of the Wesleyan Holiness Church on Cromer Road, Balsall Heath this year, thanks to voluntary effort, led by Tessa Lowe. Passers by comment on how much better the site looks, having only been grass before. 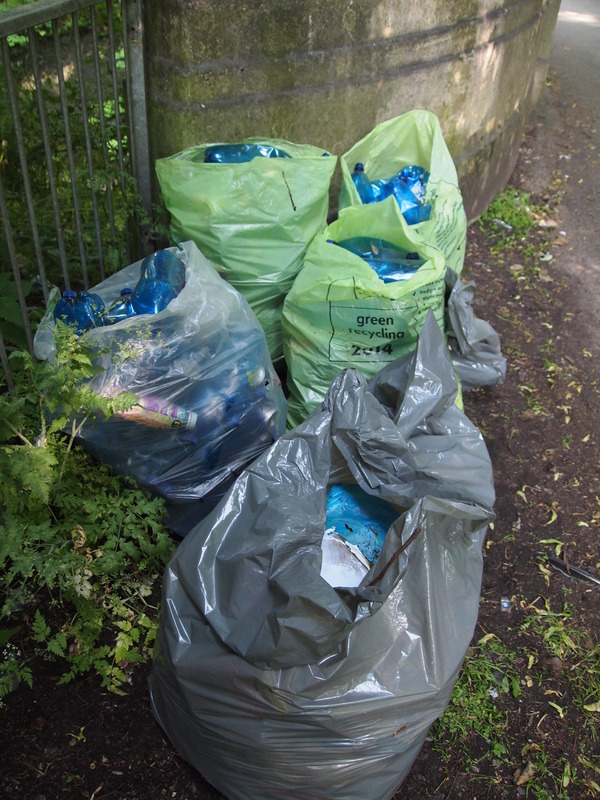 The amount of litter dropped has dropped off as well, since people see the church offering an attractive sight and someone obviously taking care of it. This shows the importance of corner sites in gardening the neighbourhood and in encouraging people to walk.. Flowers include lupins and foxgloves, which are great for feeding the bees, as well as for summer colour, so we could call it another Bee Garden. Myrtle Cottage stands in front of The Old Print Works on Moseley Road, opposite to Edward Road. It was built in the 1790s and it had a lovely garden, we can imagine. However, more recently, it was concreted over, like a lot of gardens. Jeremy Hunt, who lives in the cottage, teamed up with John Newson to lead volunteers on making planting boxes from scrap wood and planting them up as a Bee Garden. 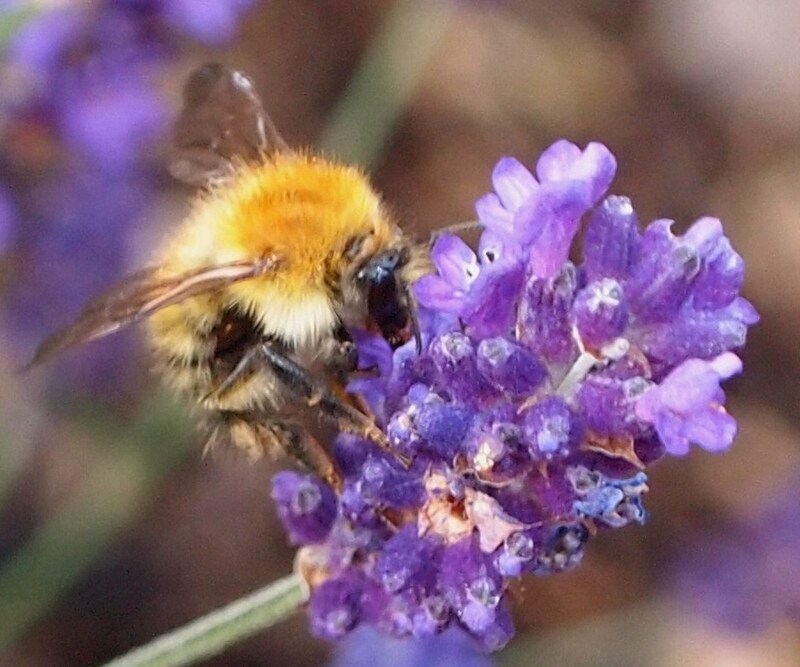 Bees need places to feed that are not doused in chemical pesticides. The environmental charity Balsall Heath Is Our Planet was happy to pay for materials. There are also edible plants and herbs. On Saturday 8th July all was finished so an opening was held with a tea and cake celebration and poems about bees and other subjects. The garden is at 506 Moseley Road and visible through the gate at any time, with more if you enter the courtyard of the Old Print Works. * Encourage my employer to do more for the environment. 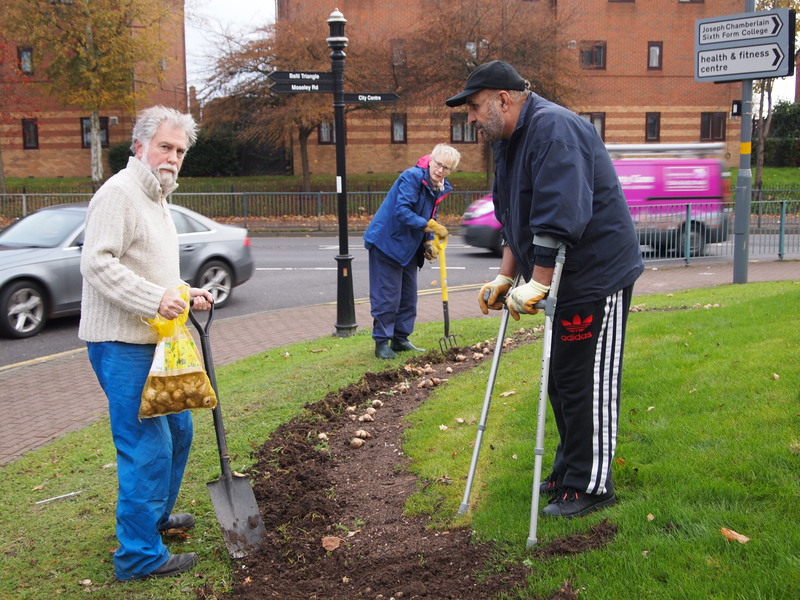 Thanks very much to everyone who turned out to help with community bulb planting at the Pocket Park in Balsall Heath on 17th November. I would say that 15 people contributed at some point. 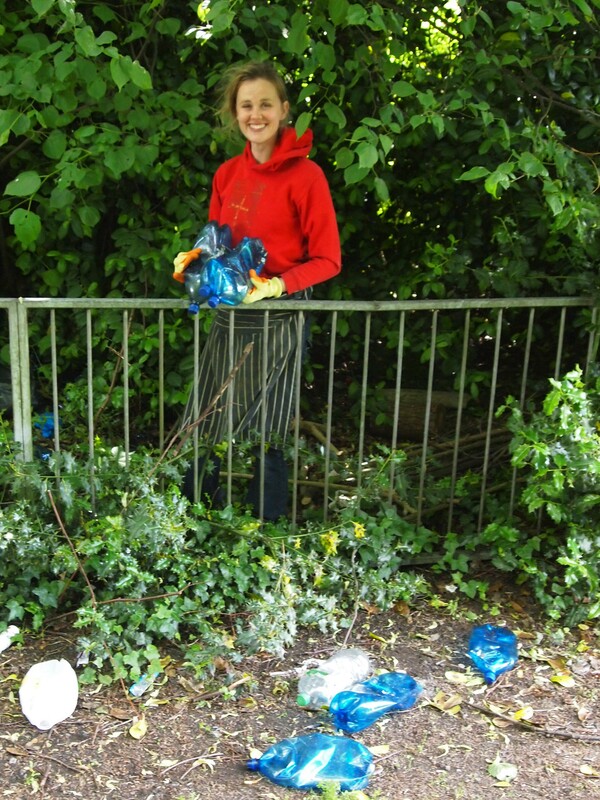 Volunteers were there from Balsall Heath Forum, St Paul’s Trust and school, also the Jericho Foundation. One man even saw us out of his house and came over to help. We got 150 bulbs of daffodil, crocus, snowdrop, iris, tulip planted, and these should make a colourful display next spring and summer, and for years to come. I notice that either no-one seems to drop litter there, or others are picking it up and putting in the bin.. The Pocket Park in the centre of Balsall Heath is providing a place to sit and enjoy the last autumn sunshine. The benches were made from recycled timber by Jericho Foundation. The design aims to make a better environment for pedestrians and was opened by Councillor Tony Kennedy on 20 October. Balsall Heath’s new Pocket Park was officially declared open on Thursday 20 October in a ceremony which had Councillor Tony Kennedy cut the ribbon. Jericho Landscape’s team rushed to finish the work and welcome us all in. Abdullah Rehman representing Balsall Heath Forum said it was an example of people working together from across the community. It was nice to see 40 people gathered, including pupils from Redstone Academy and staff from the Little Care Bearz nursery, who are neighbours and supporters. A grant was received by Balsall Heath Forum for the work by the government’s Department of Communities and Local Government. Birmingham Highways Department is the landholder and will continue to maintain the site. 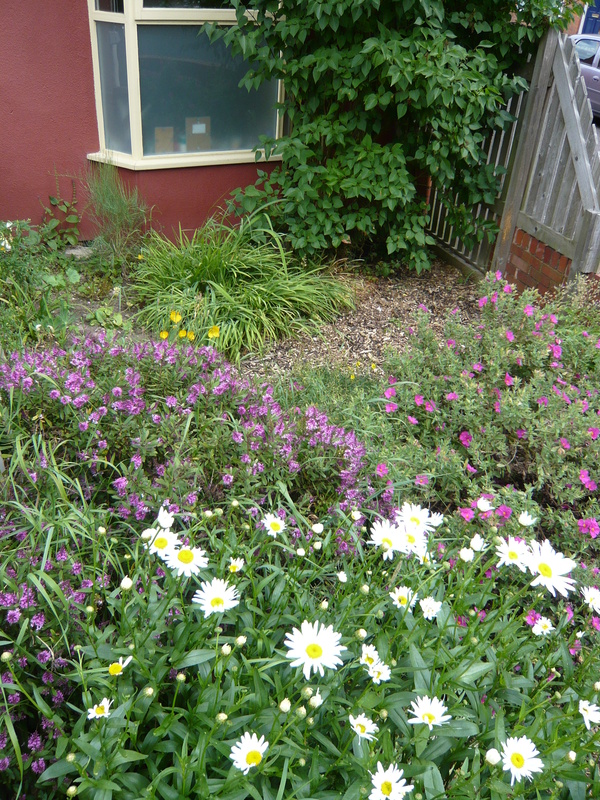 Let’s look after our Pocket Park! This location was identified by the BH Neighbourhood Plan as the place for a Town Square and the Pocket Park begins the process. A grant from central government has allowed Balsall Heath Forum to undertake the work. Tell us how you would like to see the pocket park develop and how you could be involved. Notice that there is no car parking, but some spaces in nearby streets. 50 bus.